LARENCORE: U.S : What can we do to help immigrant families ? Babies torn from their parents. Families thrown in cages. “Zero-tolerance”. This has been a devastating week for immigrant families nationwide, and it can be overwhelming-- even for us-- to keep up with everything that’s happening. We want to help you rise above the noise of the daily news and give you concrete actions at your fingertips that you can take to support immigrant families in this crisis. 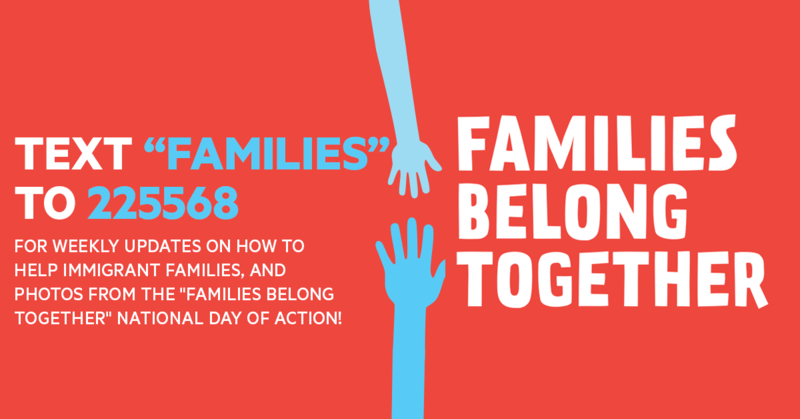 Text the word FAMILIES to the number 225568 and we’ll send you organized, concise updates on actions you can take right to your phone on a weekly basis. Trump has targeted Black and Brown people since before he was elected-- but mobilizations of the people have shut him down over and over, from the “No Muslim Ban” airport protests to the outcry that forced him to sign an executive order ending family separation last week.1,2 From Latin America to the Caribbean to the countries barred by the Muslim Ban, this Day of Action is our opportunity to show Black and Brown immigrants everywhere that we see their humanity and they do not stand alone. If you can’t make it, text the word FAMILIES to the number 225568 and we’ll send you live photos from the action, and keep you updated on future things you can do to stand with Black and Brown people. By texting in, you can make sure you don’t get lost in the flood of daily news, and know exactly what actions to take to help protect children, parents and everyone else being targeted by Trump and his administration. Thank you for standing up for what’s right. It’s people like you that history will record as the heroes, for spreading love in this time of hate.